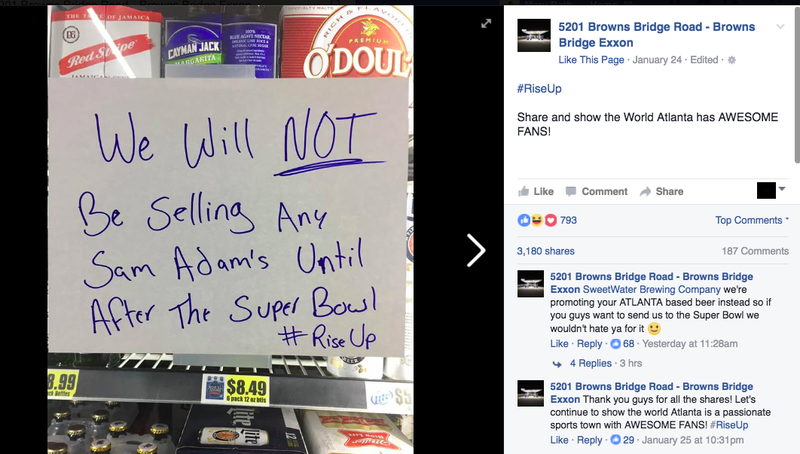 Samuel Adams may be the beer brand most closely associated with Boston, which is why one Georgia gas station is not stocking the brew — at least until after the New England Patriots and Atlanta Falcons have faced off in this year’s Super Bowl. He was inspired by a Boston Globe sportswriter’s column titled “It’s hard to get pumped up about a Super Bowl against… Atlanta” that he says “belittled” his favorite sports team. The owner and brewer of Sam Adams isn’t fazed, as he’s seen this before: he tells WBZ-TV that every time the Patriots go to the Super bowl, folks in the rival team’s hometown or state ban his beer, from St. Louis to Seattle, the Carolinas to Philadelphia. It’s not just the Super Bowl, either: in 2013, a Pittsburgh bar banned Sam Adams ahead of a showdown between the Penguins and the Boston Bruins in the NHL’s Eastern Conference Finals. “You gotta do something for fun,” Koch told WBZ-TV. The company also seemed pretty relaxed about the temporary ban, responding on Twitter, noting that “We’re still drinking Coca-Cola,” referring to Atlanta’s most famous beverage. The gas station owner is just fine with that response. “It’s fun and playful and [Koch] seems like a down-to-earth dude, so no harm,” he told ESPN.